In Miami, drivers deal with extensive rainfall every year. From mild sprinkles to full shower deluges, the onset of rain completely changes driving conditions. When the forecasters predict increased chances of rain, use safe driving skills to protect yourself from an accident. Here is how a Miami truck accident lawyer can help. Precipitation directly affects visibility and roadway friction. Combined with other conditions, such as wind and deteriorating roadways, rain creates a perfect storm for accidents. Data from the National Highway Traffic Safety Administration (NHTSA) based on 10 year averages indicates wet pavement contributes to 16% of accidents (73% of accidents involving weather) and rain contributes to 10% of accidents (46% of accidents involving weather). If you’ve ever hydroplaned on a wet surface, seen the rainbow-generating oil on a wet road, or lost visibility in a heavy downpour, you understand the unpredictable nature of driving in the rain. Prepare for the unexpected with safe driving skills designed to minimize inherent risks. Check headlights. In Florida, drivers must turn on headlights in rainy weather. As a rule of thumb, turn on or check automatic headlights every time you use windshield wipers. Do not use hazard lights in heavy rain. While many drivers use this tactic as a way to improve visibility for other drivers, Florida bans drivers from doing so. Under current laws, drivers should only use hazard lights on stopped or disabled vehicles. Keep headlights in good working condition and use other safe driving practices to minimize the risks of a collision. Go as slow as needed. Do not drive as you would in regular conditions. Leave space between you and other vehicles. Move over to the right hand lane as soon as you can, but do not stop in the lane or on the side of the road. Exit the roadway and wait out any heavy rains in a parking lot. Err on the side of caution when judging standing water. Puddles can be deceiving. You can hydroplane in only a few inches of water, and deeper puddles may render your vehicle immobile. Find an alternative route if you see standing water. Use brakes and accelerator gingerly. Avoid braking if your vehicle skids. Instead, focus on steering your vehicle in a safe direction. Accelerate slowly from a standstill to improve traction and reduce the risk of skidding. Keep both hands on the wheel and minimize distractions. During heavy rains and high wind situations, give driving your full attention. Turn off the radio, firmly grip the steering wheel with both hands, and focus on the conditions ahead. Do not use cruise control. To properly respond to road conditions, drivers need to feel and control vehicle movements on the roadways. Pull over as soon as possible in low visibility situations. If you can’t see the road or vehicles ahead due to heavy rains, you could collide with a pedestrian or a vehicle. Use your best judgment, and pull into a parking lot if the rain impedes your vision. Watch out for other drivers. Travel on the right side of the roadway and leave plenty of space to keep your options for movement open. Use the horn to indicate your presence if needed. In addition to these in-the-moment tips, keep your vehicle well maintained to improve traction, windshield wiper performance, and overall control. A driver can only do so much to compensate for threadbare tires and dry-rotted windshield wipers. Rain, wind, and other weather conditions can influence even the best driver’s performance. Take advantage of these safe driving tips and encourage your friends and family members to do the same. One unsafe driver on the roadway during a rainstorm increases the risk of an accident for every other vehicle. If you were injured or lost a loved one in a serious accident, contact our Miami truck accident attorneys today. They will take the necessary time to discuss your sensitive and unique case, spell out possible options and outcomes and begin working towards getting you compensation. 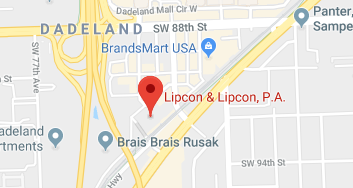 Lipcon & Lipcon, P.A. assumes all the risk with contingency fees, so don’t hesitate to set up your free consultation today.